Lesson #1: It is more important to be well trusted than well liked. In a world of repeat purchases, consolidated buying, inter-dependencies, and partnerships, greater power may have shifted to the buyer but so has greater risk. When risk to the buyer increases, customers make buying from someone they trust their top priority. Given the limited time and resources you get to spend with any of your customers, how big a priority is trust building? Most sales people jump at the chance to build a personal relationship with a customer and invest considerable time and resources to do so. But trust building opportunities, such as aggressively handling mistakes or missionary selling before buying begins, are often overlooked. It is important to identify trust building moments, strategies, and codes of behavior and to pursue them as your highest priority. I used to ask myself what I was going to SAY on my next sales call. Today I ask what am I going to DO. Customers are less interested in spending time with salespeople who just add a positive spin and offer to buy lunch over information that customers can download from the Internet themselves. Today a sales call has to be more than presenting information; it needs to be about planning, researching, thinking, brainstorming, idea sharing, knowledge building, value creating, or discovery. Lesson #3: There are bigger differences between how you and your competition handle customers than between your products. Your job is to live your product and as result you will see greater differences between your product and your competition than your customers ever will. But today there are many new ways to work with customers that did not exist before. Customers may be seeing less and less difference between product offerings but are seeing greater differences in how sales people and companies build and maintain relationships and customer interfaces. Lesson #4: You sell to a customer network, not a collection of isolated customers. Your customers are more connected to each other than ever before. Through chat rooms on the Internet, email, partnerships between members of your customer base, and newsgroups, you sell in a networked world. Assume that if you do something truly outstanding, either positive or negative, all of your customers will hear about it and be influenced. Lesson #5: Information is a commodity, knowledge is power. The old adage that, “information is power” predates the Internet. Customers can now access more information than ever and make informed decisions without ever talking to a salesperson. What now has value is the knowledge, judgment, experience, and training to help your customer take advantage of the ubiquitous information. Lesson #6: You will sell more as an agent of change than as an agent selling products. Salespeople have always been an agent of change. The job is to change non-buyers into buyers and buyers into greater or more loyal buyers. As such, the status quo is your enemy. But this idea takes on far greater importance when you are selling in a market where change is fast and constant. In the corner of the world affected by your product you can lead change, draft along with change, or get hurt by change. As a salesperson it is essential to know what trends affect your business and embrace them. Lesson #7: You are your client’s personal brand manager. The two most important parts of your brand are your brand’s promise and your brand’s deliver on that promise. For your customer, you are the key to both. Individual products, corporate logos, and letterhead can change every year but the key to winning and growing business over time is to manage the perception of your company and make sure it delivers consistently to your customer. This means managing your company’s brand on a one to one level. Lesson #8: Customer loyalty is the result of better customer strategy not better customer service. Excellent customer service has never been more important. It has also never been more common. Today, excellent customer service is only your admission to the game. The bigger question is, what do you do when you arrive on the playing field? Salespeople who invest time in creating unique customer experiences, strategically shape their customer relationships, and build multi-level relationships between their organizations have the best chance at customer loyalty. Lesson #9. It is easier to differentiate your product in the future than in the present. In times of rapid change customers want to know that what you sell them today will stay current and maintain support into the future. The differences in how you and your competition propose to do this five years out can be more varied, interesting, and compelling than the differences between your current product offerings, which are limited by the rigidity of present day reality. Lesson #10. The biggest sales will go to the most aggressive customer motivators, not the most aggressive customer pushers. What has not changed is that aggressive salespeople still make the most sales. What has changed is how the aggression is channeled. Customers are smarter and just won’t stand for the aggressive “closer” style salesperson of old. But if you use a motivational approach, your customer will view your activities as aggressively working for them. Stop pushing products, start motivating your customer to buy. 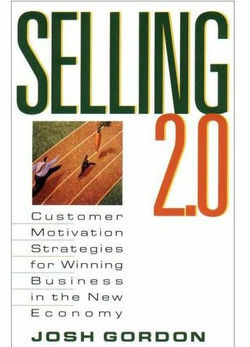 Download a free chapter from "Selling 2.0"